This integration is unique for Gravity forms. You must have the Gravity Forms plugin installed to your Wordpress site to follow this guide. After creating/configuring your Router, configuring your queues, and mapping your Gravity Form field names to your Chili Piper form, navigate to " Inbound Concierge | Router" and select "Edit" on your Router. As a field on the form as an HTML block. 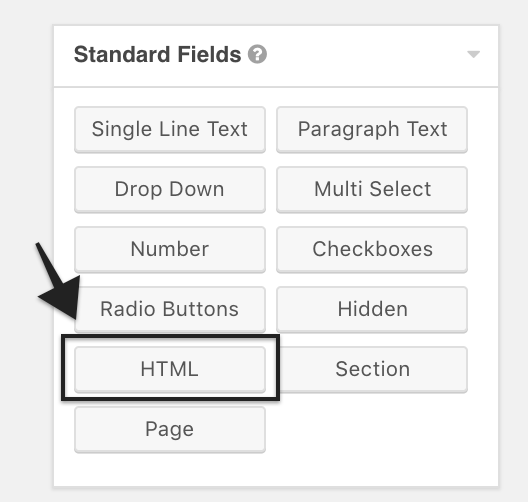 Add a new field to your form of type = "HTML"
2. In Settings -> Confirmations - add your script. b. You'll want to make sure that you choose Confirmation Type = Text. Chili Piper will handle your redirect settings. Important: Do not Enable Ajax. Your test lead values are showing up properly in your Chili Piper Router 'History'. If using Salesforce, check that your lead was successfully create and assigned to the Assignee who your test meeting was booked with. Troubleshooting Note: A period in the HTML field name may cause errors with Chili Piper's ability to interpret the data from your form. You may want to use "Standard Fields" when configuring your Gravity Form to avoid this.